BOL that is a bit scary Rubes! Hi!! Just put you down. Thanks a bunch. BOL I tinkled myself! That is so cool, Mommy is crazy for this kind of stuff, so she will be right on it and thanks. Love it! :) Hopping over to say hello! You gave us a chuckle this morning. Well, yes, Miss Ruby, you did give me a fright. Have pity on us senior doggies. LMAO! Thanks for the Sunday giggle. That is so awesome. Halloween decoration perhaps? OMD! That was so funny! Thanks for the laugh! We did the Frankenweenie thing too! It was so much fun and we think we looked frightful! BOL! 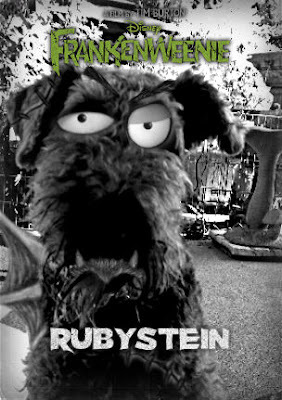 We like your Rubystein! You look great! BOL mom calls me Frankenweenie when I'm naughty! That is great! We just Frankenweenied :D....scary! Eek! Ruby, we thinks you are ready for Halloween! Yikes! Ruby??????? Is dat you???? Wow - you sure look a whole lot different, Ruby! Very scary, and very funny. Yikes, very scary because you are so pretty. haha! we're not scared, we think you look really cute! Ruby - even looking like that you are too cute to be scary! Nice try though. Two paws up for effort! No, we weren't scared here...he's sort of cute! BOL - I love it, Ruby!! !